Ulfsaar, the Ursa Warrior, has been destroying Dota newbies since the dawn of time. His design is all about hitting hard and fast, with abilities that massively increase his attack speed for a set number of hits and boost his damage with every successful swipe. Called Overpower and Fury Swipes respectively, both abilities allow Ursa to almost instantly delete a single target in the blink of an eye, before they are even able to react accordingly. Overpower gives Ursa a whopping 400 bonus attack speed, which is already close to the game’s hard cap of 600. Meanwhile, Fury Swipes applies an infinitely stacking debuff on the target, which gives bonus attack damage the more Ursa is able to hit the target. The two abilities go hand-in-hand; Overpower providing the attack speed and Fury Swipes providing the stacking damage. Fragile heroes such as supports and underfarmed carries can easily get overwhelmed by this combo alone, finding themselves quickly sent to the respawn screen after Ursa is done with them. Both abilities also make him excellent at killing Roshan, and is one of the few heroes that can do so without external assistance. Early game lifesteal items such as Mask of Death take Fury Swipes’ bonus damage into account, which means huge health gains with every consecutive attack. His ultimate ability Enrage applies a multiplier to the bonus damage of Fury Swipes, leading to gargantuan levels of attack power. 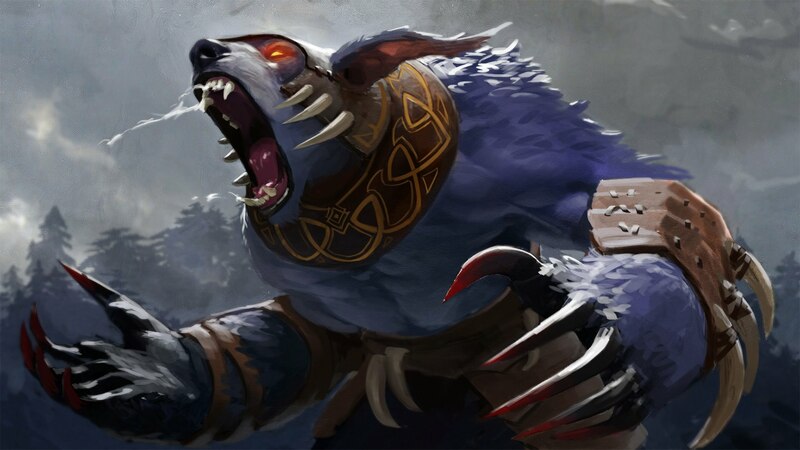 Moreover, Enrage decreases all incoming damage by 80 percent, making Ursa extremely durable for a short period of time. Enrage also applies a strong dispel on Ursa, thus removing most debuffs on cast. With Aghanim’s Scepter, he can even cast Enrage while disabled. To round out his kit, there is Earthshock, which deals damage and applies a significant slow in a small area around Ursa. Although it doesn’t hurt all that much, Earthshock’s low mana cost and cooldown make it very spammable in the lane, both for scoring last hits and harassing enemy heroes. All of these aspects come together to form a seriously frightening package, particularly in the lower end of the matchmaking system. It wouldn’t be surprising at all to see those in the bottom of the barrel complain about Ursa because of his design—but truth be told, he is far from perfect. His biggest shortcoming is his complete lack of late game power, often getting outcarried by heroes such as Faceless Void, Spectre, Medusa, and Chaos Knight. This makes him very reliant on having a good early to mid game, as he can quickly become deadweight if he is unable to snowball. His effective range is also totally limited to point blank, which means that he requires mobility items to even get into the thick of things. Once in the fight, Ursa can be kited rather easily, especially when opposing heroes are equipped with Force Staffs and other protective items. This becomes a much bigger issue as the game goes on, as Ursa burns through Black King Bar charges fairly quickly. But even with his weaknesses, Ursa does find a niche in mid game focused strategies, where the goal is to win the game before the enemy carry is able to go toe-to-toe with him. With the right composition around him and an aggressive approach to the game, teams running Ursa can break the throne before the other team can respond. As a strict core, Ursa’s skill build is fairly simple and straightforward. Ideally, your first skill point should go to Fury Swipes, as it does help a little bit when scoring last hits in the lane. Simply attack the creep taking the most damage a few times while its health is still at least 50 percent, then finish it off with a damage-boosted swipe. If you and your team want to get aggressive, though, Earthshock might be a better pick for its slow. Overpower should be leveled in the laning phase alongside Fury Swipes, which gets first priority. This is to gear up as soon as possible for a Roshan attempt, which obviously requires as many points in both abilities as possible. We recommend buying yourself a Smoke of Deceit before attempting to kill Roshan, so that you can sneak past any wards that may have been placed along Roshan’s pit. Remember that wards cannot be placed inside the pit itself, so if you manage to get into the pit without any trouble you should be good to go. Still, it’s a good idea to ask your supports to ward a few paths to the pit, just in case your opponents decide to check if you’re there. Earthshock should be maxed last, as the starting 25 percent slow should already be enough for you to keep your targets within range. Meanwhile, Enrage should be leveled at every opportunity, thanks to its great scaling. Because Ursa’s range is so limited, items that help him reposition himself on the battlefield are key in the early to mid game. Phase Boots should therefore be the first item you aim for, as it does give you a nice amount of bonus damage and the ability to walk straight through units to get to your target. After Phase Boots, you can go ahead and purchase a Mask of Death, which will allow you to jungle without too much trouble and later go for Roshan. In the minutes leading up to the mid game, you will want to purchase a Blink Dagger, so you can initiate instantly with Earthshock into Overpower plus Enrage. Simply using Phase Boots to get into the fight is not enough, due to Ursa’s average movement speed and lack of natural spell immunity. He will get disabled before he is able to get up close, which makes Blink Dagger a necessity. And after Blink Dagger comes the hard part: deciding whether to get BKB or Aghanim’s Scepter. Aghanim’s Scepter works very well against lineups that stack hard disables, such as stuns, lifts (think Invoker’s Tornado or Cyclone from Eul’s Scepter of Divinity), sleep (Bane’s Nightmare or Elder Titan’s Echo Stomp; Song of the Siren cannot be broken out of), and more. Being able to purge such effects off instantly is actually kind of amazing, and you get a bonus in the form of a decent cooldown reduction. On the other hand, BKB is best used against teams that have a lot of silences—as it is still impossible for Ursa to cast Enrage if he is silenced or hexed. In the case of the latter, though, Linken’s Sphere would be the better choice, as there are no area of effect hex spells in the game. Unfortunately, BKB does fall off sharply late game, especially on a hero that burns through charges quickly like Ursa. Once you are past this junction, though, the whole shop opens up for you. Diffusal Blade works surprisingly well on Ursa, since the active ability slows the target down a ton. The passive, on the other hand, works in tandem with Overpower—burning away a large amount of mana in the process. Desolator helps your team if your lineup is reliant on physical damage. Basher into Abyssal Blade is a typical path for Ursa, who desperately needs the late game lockdown. You could even consider Scythe of Vyse, against lineups with heroes that have strong dispel mechanics (i.e. Abaddon). Ursa’s typical teamfight/gank combo isn’t difficult at all, but because of the rather long cast animation of Overpower, getting all of your spells off quickly can be a bit tricky. Make sure that you’re using everything available to you, and that you’re not skipping any of your important spells. That said, it’s just a matter of blinking in with Blink Dagger, following up with Earthshock, Overpower, and Enrage. Try to go for a key support in the back first, in order to reduce the enemy team’s available utility as soon as possible. Then, clean up the rest with your team. Use BKB and any other items as needed. Don’t forget to use Abyssal Blade if you have it, particularly against carries and other cores that wield BKBs. If you opt for a Scythe of Vyse, you will probably have to use it on a support or an underfarmed core, particularly those without Linken’s Spheres or BKBs of their own. If the enemy team has an instant silence like Silencer’s ultimate ability Global Silence, make sure to wait for it to hit you before activating your BKB. Global Silence still does go through magic immunity, but it is purged by it upon activation. Again, Ursa’s biggest weakness is his ineffective late game. He does not have the same exponential scaling that a more late game-focused carry like Phantom Assassin or Chaos Knight. Moreover, he is designed to be a good snowball hero, which means that he is nothing if he gets shut down early game. If your team is able to cripple him early on, you should have a much easier time against him—especially if your own carry is keeping up in farm. His short range (both in terms of his regular attack and Earthshock) is also another one of his worst shortcomings. Kiting Ursa is of the utmost importance, which makes it a good idea to pick heroes with a lot of reach. Of course, this can be neutralized with Blink Dagger, so be wary of where Ursa might teleport from. As for specific hero counters, heroes that can continuously disable Ursa are great picks. Bane can Enfeeble Ursa to reduce his damage in the lane and in teamfights, making him less effective overall as a carry. He can also use Nightmare and Fiend’s Grip to stop him dead in his tracks. Lion and Shadow Shaman both sport Hex, which cannot be removed by an Aghanim’s Scepter-enhanced Enrage. Carries that can take him on in a duel are few and far between, but Razor, Troll Warlord, Weaver, and Windranger all have their own ways of dealing with Ursa. Razor has Static Link (cannot be dispelled by Enrage) and Eye of the Storm to slowly turn the fight around and Troll Warlord has blind from Whirling Axes and a potent stun from Berserker’s Rage. Meanwhile, Weaver can kite Ursa around with Shukuchi, and Windranger can do the same with Focus Fire and Windrun.